I want to know who will eat the mera-mera no mi Buah ? put a freakin spoiler!!!!!!!!! i looked at this and got SO upset cause i'm not there yet! the one who ate the mera mera Buah is SABO! It's hard to know. For a start, if Luffy recovers the fruit, there's no chance of him eating it himself... However, that is assuming that he does recover it. If Doflamingo is using the Mera Mera No Mi to try and lure in Luffy, then I can imagine his plan suceeding. Luffy is certainly reckless enough to be lured in. So, if he recovers it, I imagine he will either destroy it, atau give it one of his crew-mates. This is my theory, anyway... I can't say much lebih than that, as I don't read the Manga and only know what I hear on this club. Feel pretty much the same. Yeah. I doubt he'd destroy it, he loved his brother and wouldn't get rid of it, as it is something to remember him from. But I think he could eat it. 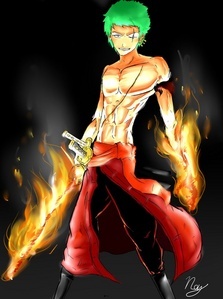 If he was to give it to another crew mate, it would be, without a doubt Zoro. majority says luffy eat it. api, kebakaran FISTED gajah GUN!! Where is exactly is the evidence for this? So far, we can deduce that Teach only was able to eat the Gura Gura No Mi, because he has the 'Darkness' fruit, therefore allowing him to control the demons inside the Devil's fruits. He could probably eat lebih if he wanted to. I don't think Luffy will eat it. 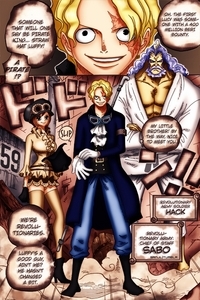 Besides, the Will of D is something that Garp, Teach, Ace, Dragon, Roger and Luffy have in common... They don't share eating 2 devil's fruits in common, but they share that same fiery willpower, which is what the Will of D is - It allows them extraordinary willpower... I mean, look how willful each of these individuals are - Teach is a Yonkou, Ace was a Commander in the most powerful pirates for a time, Luffy has a massive bounty, Garp is a Vice-Admiral, Dragon is the leader of the Revolutionaries and Roger was the Pirate King... Does that not tell anda something? Exactly.. Its kinda obvious Zorro's Shishui is gonna get the fruit. ^ Maybe, maybe not. If this is the case, then the whole Will of D theory would be irrelevant to eating two fruits, since Teach ate two and it is berkata that it is either Will of D, atau Yami Yami No Mi... If he doesn't have the 'D', then Will of D has nothing to do with two fruits. @akay. Actually, i looked it up and it is semi-correct... One Piece Wikia says that it was a claim sejak Whitebeard that the D in Teach's name was not real, therefore he doesn't possess the Will of D. Also, he showed signs of fear when confronted with death... Which contradicts the known effects of the Will of D, which states that all known people with the D in their names have all shown signs of not being afraid of death and even laughing at it, like Luffy and Roger. ok. my english is not so good so I hope anda will understand my answer. my opinion is Luffy will eat mera mera no mi. All of us knew that blackbeard already ate 2 fruits. For your information, its not because of yami2 no mi that allow blackbeard to ate both of the fruits. Its because of the intial D in his name. This is one of the secrets of Will of D. maybe D is Dual, Dwi, Double. We dont know. But the person with D in his name, has a special abilities,fate,power,spirit.So, im pretty sure, luffy will eat that Buah make him equal power to blackbeard sejak using ace's fruit, luffy will take revenge on blackbeard and akainu. Its luffy afterall. impossible is possible. Sanji will not eat that Buah because he already berkata that he didn't want to eat DF except for invisible fruit. sejak the way, he still want to swim using Blue Walk. So, either new character come out, blakbeard crew eat that Buah , atau Luffy eat that fruit. For me, Luffy will eat that sejak ignore the taboo. done. While I find this an intriguing thought, I'm not so sure about this... I just can't see Luffy eating two fruits, atau being anything other than the rubber man, rather than the rubber/fire man... Besides, wouldn't his body be unable to cope with fire, being rubber? I hate how some people don't read what other people have said, prior to their own thoughts, especially on jawapan like this, where there were already like 8 comments. I agree with this. I definately think Sabo is alive and that he'll come very dramatically and win the fruitt and eat it. If not then I think that the Buah is going to be destroyes atau taken away from everyone sejak Donflamingo. 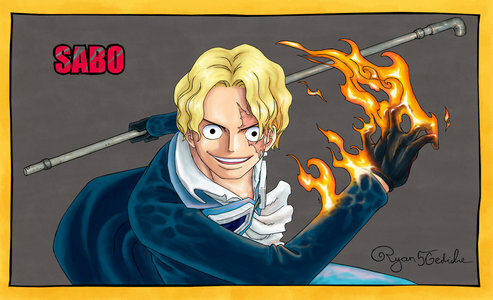 I think sabo. He is shown to be alive in Manga 731. I think luffy will not destroy it because it is a memento of Ace.. and won't let others eat it unless it is his crew. Yes maybe one of his crew. not Franky because he already berkata no, not brook,chopper,robin they are already devil Buah user... Possible Luffy I don't know how.. but because Blackbeard have 2 devil fruits now.. it is also possible that Luffy may have 2 powers. Tho Sanji has api, kebakaran skills so seterusnya to possible eater is Sanji.. Zorro no because he prefer only using sword... nothing else. I would like to point out that Blackbeard only has two Devil's Fruits, because of the Yami Yami No Mi... Luffy can't eat another Devil's Buah - if he does, he would die. 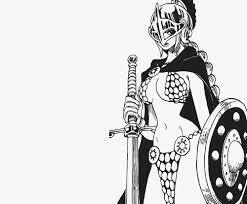 I think this Buah would compliment Sanji's kicking ability quite well. 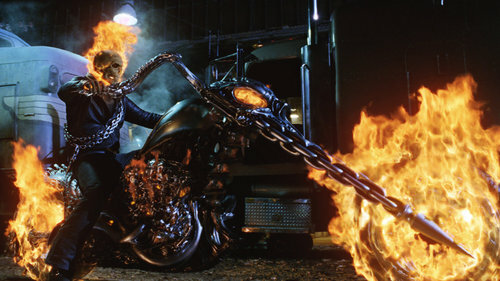 He would become fire, and would kick with full-blown api, kebakaran and be able to use another set of abilities. It would be epic! I think Sanji is the best to eat the Buah because he is good in combat ability. The mera mera no mi ability is the best for Sanji to make the crew stronger and to use the maximum potential of Sanji. Yeah, that would be pretty lame. Ace's Buah is awesome! Hmmm, that's an interesting thought, but didn't Doflamingo resign as a Warlord? I doubt he'd stick around with any of them. Lets assume Luffy actually gets the fruit. If anybody in the Strawhat pirates is gonna eat the fruit, it'll probably be Usopp; if not, then Luffy didn't get it. Yeah, I'm aware... I just think it would be cool, but clearly he won't... At this rate, we can assume that either an enemy will get it from Doflamingo, atau Luffy gives it to one of his crew-mates that would actually eat it. And Zoro won't because he has berkata that he wouldn't and wants to be able to swim so that he can rescue Luffy from being drowned, in case that happens. I think Usopp will not eat the Buah and the Buah not Suits him because he is not too good in combat ability like Sanji and Luffy, and the former user, Ace. The Buah new user must be someone who possess a good combat ability. Sanji is probably the best. The Will of D refers to people like Luffy, Dragon, Garp, Teach, Roger and Ace, who all have extraordinary willpower... The Will of D has nothing to do with Devil fruits, otherwise they'd all have two each. Teach, again, ate the Gura Gura No Mi, simply because his Darkness Buah allows him to be able to control the devils/demons inside of the Devil's Fruits... He could probably even lebih if he could get his hands on them. What if luffy use haki power and eat mera mera devil Buah same time? What difference would that make? 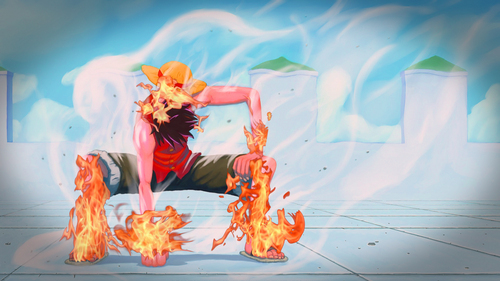 Haki is simply an embodiment of 'willpower', atau spirit power manifested into various uses. It won't make him able to eat another Devil's Fruit. i think "D." abilities is to take atau eat 2or lebih devil's fruit... just like Marshall D. Teach. No, it's called the Will of D... Each of the people with 'D' in their names has extraordinary willpower... Have anda not noticed that? Besides, if D was for eating two fruits, then surely the others would have considered it, too. Kinda coincidental how the only one that has eaten two fruits was the one with the Darkness fruit, one that would actually allow the eater to control the demons in the fruits... I mean, he's the only one who holds a Logia type that has several different abilities - This is obviously another. Plus, he used the curtain and extracted the Gura Gura No Mi from Whitebeard's body. and berkata his dream to join. Guess what it is that he want to find all blue and if he can't swim how can he find all blue . Why don't anda get it. I wasn't being totally serious... I know he won't eat one, I'm just saying that because it would be cool, if sejak some slim chance he did actually eat one. i think someone else is going to sertai luffys crew who luffy is later on going to give it to him. So far only Jimbei is planning to sertai them... I don't think anyone else will until then and probably no-one will after that, though that's just a guess - I can't say for sure. ^ Maybe... He wouldn't sertai a pirate crew, though. Just because he Lost to Akainu and left the Marines doesn't mean he will automatically sertai a pirate crew. Alright guys. But here's the correct answer. Zorro's sword. Remember how it coincidentally went missing? That's right. 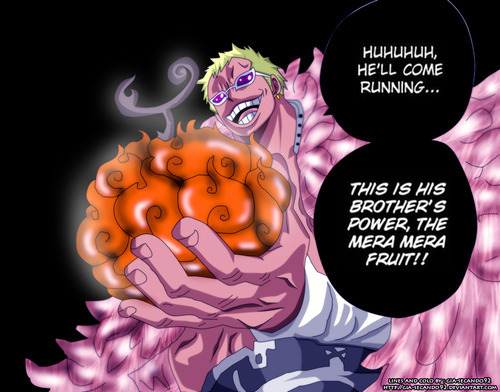 It's so obvious really..
Zoro wouldn't eat a Devil's Fruit... No way. I believe he values being able to swim and I even recall him saying so sometime throughout the series. ^ It's probably not possible, but, then again, some crazy things have happened in One Piece. anda never know. @bhalraam32. Cool it down, I simply misread the question, there's no need to make that displeased face. I think it is better if brook will eat the mera-mera no mi fruit. ^ Says who? Just because Teach ate lebih than one doesn't mean that anybody will the D in their name will eat lebih than one fruit. Actually, he was pretty clear on this, and the number of lives it gives is exactly 1. Following the use of that life, Brook no longer has access to that portion of his ability. He cannot come back to life following the eating of yet another Devil Fruit. The possibility exists that he would have survived eating another Devil Buah sejak using the first to revive himself... if he had done it before he Lost that first life. As he is now, he's just as vulnerable as any other Devil Buah user to the effects of eating a second. I think the 10th Straw hat is in this Arc for two reasons. 1 this is going to bring up some stuff About Ace & Luffy so already this is a tear jerking arc. 2. I think Some one who ADMIRED ACE is going to Eat the Buah but we under Doflamingo's Command. That person is going to Fight Luffy & will Insult and Call Luffy out for Letting Ace this person's hero die. Luffy will tunjuk him the power of his bond with his Nakama & Ace sejak defeating this person with a Gomu Gomu no red hawk. At witch Point Luffy and this person will become Friends & Luffy will get his 10th crew Member.Along with that the 10th Crew member has the Power of Ace. This seems the most likely, to be honest. I don't see Luffy eating the Buah himself. Luffy will eat the Buah is my biggest hunch. I've seen a lot of things saying ITS WILL OF D THAT ALLOWS IT. atau ITS YAMI YAMI THAT ALLOWS IT. It being the possession of 2 Devil Fruits BUT, what we KNOW is that we dont know ^_^. The only thing that has telah diberi us a clue to why blackbeard has 2 fruits in his body is Marco's Statement "But blackbeard's body is fundamentally different than others". We don't know if its just because he ate yami yami (though i think that's too simple and woulda been stated) atau because some other reason. So the possibility of luffy eating it is still there. Some posts berkata Rubber/Fire Man? Couldn't Work! LOL have anda been watching? Luffys attacks and actions are slowly having api, kebakaran added in. Running with api, kebakaran in his Tracks. Redhawk a alih that even shows ace momentarily when its originally used. I say a api, kebakaran rubber man goes together all too well as of now. api, kebakaran Gatling gun. Burning Bazooka. 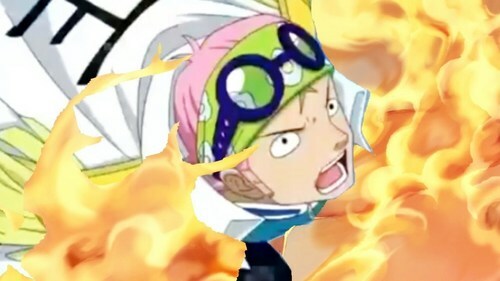 Since luffys attacks are all physical i can definitely see them being imbued with fire. Its true its hard to see him as anything but a rubber man BUT if he was EVER EVER EVER gonna have another Devil fruit, this would be it. P.S. For some reason i feel as though even if he gets the power he wont have the Intangible side of the logia. Just firepower added. but who knows. So there's two theories. I get it. But, I disagree that Luffy will eat it. I don't see it happening, at all. For one, it's lebih logical that eating lebih than one Buah is a result of the Yami Yami No Mi, rather than Will of D... Secondly, it would kinda kill One Piece a bit. Here's some evidence for you, from One Piece Wikia: 'Teach (Blackbeard) Possesses an "atypical body structure" that permits him to wield two Devil Buah powers.' - This implies that his body is reason he can have two fruits... Whether it is because his body can become darkness, atau because he's chubby, we don't yet know. Hi everyone! I think that the MERA MERA no mi will either go to sanji (because his attacks would get a thousand times better and he would be able to cook when ever he wanted, also if he was about to fall into the waterhe could use "sky walk" and fly!) either to a new nakama of Luffy. Luffy can't eat a saat devil Buah and his body won't be able to stand it. I read that some of anda say that Blackbeard "ate" 2 akuma no mi that's false because his powers(yami yami no mi) made him able to absorb other powers (as he says to ace, and he is able to hit him ) so he ABSORBS whitebeards power... Your argument is invalid. GO api, kebakaran SANJI!!!! No. Blackbeard can have two fruits, because of his atypical body structure. I telah diposkan an artikel about this two months ago. I suggest anda look it up. I think that ussop will be the one to eat the df because he would be the one most suited for it.nami would be to scared franky denied zorro and sanji are the ones to all save luffy drowning. I think that Cobi gonna eat ace's devil fruit! i think that there is only one possibility for Luffy to eat another Devil Fruit. This is, his ability to stretch.That means, that his stomach can defy the physical law of a human body.that means also that his body,can accept another devil fruit.its a theory.But practically we can accept it. Rebecca , that would be my guess , then she'll become the newest Mugiwara's member .. Just a personal theory though , And I think it wouldn't make any sense if Luffy atau any of the other members eat it , Sanji already uses haki and gebbo (air jumps) ,Zoro is one of the best sowrdmen now in my opinion , he doesn't need any other powers , as we all know in every pirate crew there is a good sowrdman who doesn't use any devil Buah powers , so we can exclude Zoro , Now Nami , She is the navigator of the group , it wouldn't make sense if that powerful Buah goes to her as she is not into fighting that much , the same goes for Ussop , he is coward and it wouldn't be wise to give him that Buah , Choper ,Brook ,and Robin have devil Buah powers so they can't have it , Franky is a strong cyborg , he has multi-functional abilities ... I don't see anyone who can have this Buah powers but Rebecca , Luffy likes her and she became so close to the crew , probably he'll give it to her after she joins them .. The power of the Will of D is still unknown. Some say it's just Will power but if anda look it up it also says that they have something to do with the void century ( poneglyph country). What if Donflamingo got interested sejak the power of D and actually wants luffy to eat the Buah to see what happends. This way he could lure luffy + have some research on how the Will of D works / how people might be able to eat 2 fruits. Sanji won't eat it because of his dream. Zoro won't eat because he just wants to be a swordsman. Nami and Usopp are not suited for the power. Also this way the crew is balanced in case of people into the water. Just think about it. If only 1 atau 2 of the crew would have to swim to save 7? If people think api, kebakaran and rubber can't be used together anda should think about all of luffy's attacks. Almost all weapon attacks. I think every weapon get stronger when using api, kebakaran to shoot it. Rebecca won't eat it because I think the Buah is brought back for a reason and from my point of view I dont think she is gonna sertai the straw pirates. About Sabu I don't think he died but I think he is one of the commanders of a Yonkou like Ace used to be. So I would say luffy eats the Buah accidentaly atau because he is just stupid. He might get sick atau something and is about to die like we have seen before but after he recovers he will be able to use 2 devilfruits like Teach. Luffy can't eat it. He would likely die. The only reason that Blackbeard ate two, is because of his atypical body structure. If anda doubt that, then look it up on One Piece Wikia... atau refer to the artikel I telah diposkan around 2 months ago. It only says Teach has that body structure. It doesn't say luffy hasn't got the same structure. He can get fat and just slim again because of his fruit. + Don't anda think it's typical teach hid himself when stealing/eating the fruit? anda can look at luffys body and compare it to teach's and easily tell they don't have the same body structure.. Also the whole body structure thing isn't even solid since it is just a theory/guess from Marco and hasn't been proven. It is most likely because of teach's devil Buah because of the qualities it posses is to allow him to nullify devil Buah powers, also to absorb things, his body is basically a black hole which can house room for two devils and keep them from meeting. Also luffy knows he can't eat the Buah because grand line scientist have berkata that eating two fruits will tear anda body apart, luffy isn't stupid. But, If Luffy eat it, somehow the story become not-so-interesting because he will become too powerful so sudden. Luffy strengths usually improves bit sejak bit and that what make him so cool. So, i think Sado will eat it. Because Ace and Sado are childhood friends~ but the possibility is low as Sado is nowhere. I disagree with Luffy getting a sudden power boost IF he does in fact eat the mera mera no mi. For one its a logia so it might take years for Luffy to learn how to use it properly and also Luffy may not even depend that much on it. I believe it is possible however that Luffy can eat the fruit, I mean he got hit with enough poison to kill a man 10x over; not to mention he recovered faster than Ivankov predicted. So yea it is possible but its only like a 5% chance that Luffy eats it. @badrauno.. Lol. There's a blatant difference between using api, kebakaran with one attack and learning how to use a DF that allows the eater to become fire... besides, Luffy learned Haki over a two tahun period. Cryogenic is right. Ok why don't anda guys who keep thinking that the reason Teach is able to use multiple devil fruits has something to do with "the will of d"? His devil Buah power allows him to absorb and control anything in his range, essentially because its gravity, including the power of devil fruits which he stated when he touched ace. So what would make anda think any differently about him being unable to control a Buah inside himself? After Membaca some of the thoughts and opinions about who will eat Ace devil Buah I got kinda of frustrated and decide to place my input. First luffy can not eat Ace's devil fruit, why? 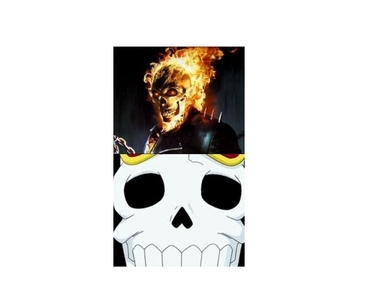 well because the only reason tech has the ability to take other people devil fruits is because of the power of his own devil Buah look at it this way if tech had this power from the will of D and that stupid thing people say about his body structure allow him to have lebih then one devil Buah powers then why in the world would he wait untell after gaining this power to take devil Buah powers, also his devil Buah power is like the king of all devil fruits it's a complete demon it's darkness darkness can consume all in to an endless black hole of darkness and that's what allows him to consume lebih then one devil fruit. His body structure has ntn to do with it unless anda mean the body structure he obtain from having this power. now about who most likely will get the mera mera no mi Buah my opinion on the most likely one in the straw hat group would be sanji. and he out of any one else would have a better kick with this fruit. He's already using api, kebakaran base attacks it will only increase his ability even more. and him consuming this does not mean he wont be able to achieve his dream of all blue. If anda recall on the skypia ark when the ship fell out of the sky and Luffy Zorro and Sanji when in the water to check it out Luffy was able to alih freely in water with a submarine suit despite the fact that he can't swim and he didn't felt weak. 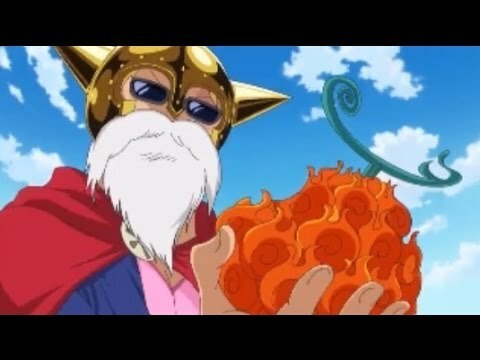 Ether way I'm still not sure if Sanji would eat it and we all know the others wont, Ussop may be able to get a kick out of it where he could flame his shots to be even lebih powerful even tho I strongly believe Usopp should of learn Busoshoku Haki since I'm sure he'll have to face some logia types soon and just to over all power up his attacks. My only conclusion is that if luffy does win the tournament and he gains the Buah my guess is that Rebecca may beg of him to help her take down Doflamingo atau if he can please give her the fruit, ether I think theres a great chance Luffy may give her the fruit,why? Luffy trusts people quickly and if he feels that she is some one he can trust he may just give her it but there might be a good chance she will sertai the crew in return. What I also think could happen is that luffy will keep the Buah as a momentum of Ace and cherish it like his hat. Zoro already said, ages ago, that he would never eat one. Also, anda don't necessarily require a Df to cut fire... I'm there would be a technique to it, like perhaps something they would teach in the Wano kingdom. no matter she will win fighting atau not.. I don't think rebecca will get it. Technically she is the seterusnya heir to the takhta so she might stay and be the Queen after they pwn Doflamingo and his crew. If he doesn't want to give it to anyone then why did he offer to give Franky. He just doesn't want some "stranger" to eat it. 2) Luffy will not allow the Black Beard Pirates to have the Mera Mera Buah because of his brother, but if it doesn't go the the crew, who would he trust with it. While he could just keep it on the ship, he does seem to sympathize and trust her, maybe to to the point of giving to her. So what do anda guys think? 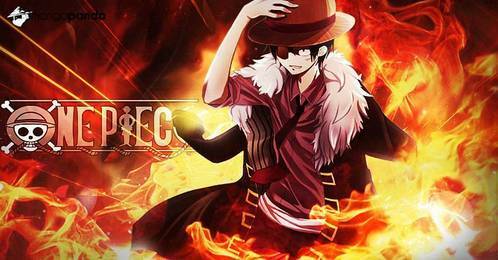 5th:he wants to be the king of pirate why some others can have 2 devil powers like blackbeard and he can not ? who have something to say ? luffy cant eat another devil fruit...-_- done. So get ready "santoryu flame demon slash"
Spoiler Alert!!! But probably Sabo because he is alive!!! if i am not the onl one checking details.sabo was at the coloseum.he mentioned that luffy will be seterusnya pirate king and that he will take care of the mera mera no mi.sabo is the adopted brother of luffy and ace.check one piece wiki if anda do not belive me. Ok, well i know that this isn't totally realistic and overpowered , but it is perfectly possible. What if Luffy won the Mera Mera no Mi and gave it to ZORO! That would be so fricken' epic am I right? Lol, I don't think that's what the Will of D is about. Blackbeard ate two fruits, because he has an unusual body structure... Luffy can't eat it... well, he could, but he'd die. ^ Yeah, we already know. In one of the chapters I think it was between 715-725 a art shows Luffy on api, kebakaran and that might mean that he will aquire both the rubber Buah and api, kebakaran Buah as Blackbeard now has two also. Other than that I think the only possibility would be is give it to Rebecca let he beat Doflamingo and assist her in that and make her one of your crew members. The last possibility has no evidence behind it, but I just think it would be cool ending to the arc. anda evidently haven't read anything about why Blackbeard could have two Devil's fruits... it's because he has an unusual body structure, atau 'atypical' body structure... likely due to the fact that he was the eater of the Darkness fruit, atau it's something to do with his body and his body alone. Luffy can't eat another Devil's fruit, because he would literally die... in fact, I believe it is actually canon that Blackbeard ate the Gura Gura No Mi specifically because his body structure allowed him to. End of story, basically. Luffy already berkata he won't eat it, so clearly Oda has no plans to make Luffy eat it... I think you'll be waiting indefinitely for that one. An interesting idea. I wonder if a DF has ever been telah diberi to a bot before... although I'm not so sure about a wooden bot being able to become fire... maybe if it was a different kind of fruit, maybe a Zoan atau Paramecia. But then wouldn't the bot just sink, since anything that has a df becomes a "hammer" when it hits the water? Yup. I told those idiots that Luffy wouldn't eat it. Lol.